Advances in genomics and biotechnology are enabling quantum leaps in the understanding of soybean molecular biology. The problems that face the soybean industry also are diversifying and escalating on a global scale. Designing Soybeans for 21st Century outlines current and emerging barriers in the global soybean market, principally: 1) long-term ability to sustain production to meet continued growth in demand for soybean and soybean products; 2) governmental and legislative policies; 3) global access to advances in soybean technology; and 4) customer and consumer trends in the use of soybean products. 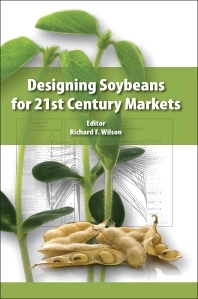 The book also addresses state-of-art steps that should help move soybeans past these market barriers as advances in genomics and genetic engineering are deployed to design soybeans and soybean products that meet the challenges of 21st century markets. Includes both an overview of the economic outlook of soybeans and details on the advances in soybean genetics and genomics. Concise and well-organized book with five main sections covering everything from regulatory issues to advances in genomics to commercial production for yielding a superior product. Edited by a global leader in the field of oilseed genetics, molecular biology and bioenergy research. Richard F. Wilson received graduate degrees at the University of Illinois with emphasis on analytical and lipid biochemistry and was employed by the USDA ARS for 32 years. He served as Research Leader for the ARS Soybean & Nitrogen Fixation Research Unit at Raleigh NC from 1980 to 2002. He also served as an adjunct Professor of Crop Science at North Carolina State University during that period. His research on the biochemical and genetic regulation of seed composition in soybean is documented by over 225 peer reviewed publications, 11 books, over 125 invited presentations at international or domestic meetings, and 23 awards for research excellence including the Outstanding Achievement Award (United Soybean Board, 2007) and Secretary’s Honor Award (USDA, 2006). In 2002, Dr. Wilson moved to Washington, DC to become the USDA ARS National Program Leader of oilseed programs for genetics, molecular biology and bioenergy research. In that capacity, he developed strategic plans that were relevant to industry needs, directed/redirected projects to implement high-quality research programs, and conducted project evaluations plus assessments of overall program performance for over 370 ARS projects. Dr. Wilson also coordinated and maintained research accountability for National Research Initiatives that addressed specific targets of the oilseeds research program. Examples include genomic research that revealed genomic sequence of soybean and bioinformatic efforts that led to the creation of the Legume Information System. Dr. Wilson retired from the USDA in 2007. He now is a consultant based in Raleigh, NC.